Discussion in 'Articles' started by Sykikal, Jun 17, 2015. The Last Guardian: A game that was announced in 2009 with a planned release in 2011 exclusively for the PlayStation 3, and since has suffered several delays. The game is now scheduled to be released in 2016 exclusively on the PlayStation 4. Horizon Last Dawn: A new IP from Guerrilla Games, the developers of Killzone. The trailer starts with a a woman exploring caves, and a narrator describing how civilization fell and reverted back to tribes. Sentient technology grew as well, creating creatures that look like animals. Hitman: The next installment in the Hitman series, titled just "Hitman", is coming to Xbox One, PlayStation 4, and PC this year. Those who buy it on PlayStation 4 will receive six addition contracts. Street Fighter V: Though the game was already revealed to only come to PlayStation 4 and PC, Sony revealed that Cammy and Birdie would be playable characters. Dreams: A new game coming to PlayStation 4 from the creators of Little Big Planet, Media Molecule. The game lets the player use DuelShock 4 to sketch creations. Destiny The Taken King DLC: Destiny's upcoming DLC got a trailer and is scheduled to release on September 15th, 2015. Firewatch: A first-person adventure game that lets the player explore the wilderness in Wyoming. The game doesn't have a release date yet, but it is going to be released on PC, Mac, Linux, and PS4. World of Final Fantasy: A game focused on small cute final fantasy characters, which can grow back to their original size when needed. The game is scheduled to release on PlayStation 4 and PS Vita in 2016, with no word on a release for other platforms. Final Fantasy 7 remake: The highly anticipated Final Fantasy 7 remake was finally announced, and is scheduled to release first on PlayStation 4. Other platforms have not been announced yet. Sheamue 3: Sony helped to promote a Kickstarter for the developer Yu Suzuki, where he was seeking to launch Shenmue 3. The previous two Shenmue games were released on the Sega Dreamcast. In only a day, the game already exceeded its 2 million dollar goal on Kickstarter. Batman Arkham Knight: Sony released a new trailer for this game. The game is coming June 24th to PS4, PC, and Xbox One. People who get it on the PS4 can receive the exclusive scarecrow nightmare missions. Asassin's Creed Syndicate: While this game was already revealed at an earlier Ubisoft conference, Sony announced that players who order this game on the PlayStation 4 will receive the exclusive Dreadful Crimes DLC, which involves solving crimes inspired by a famous detective. Call of Duty Black Ops 3: Sony showed a new trailer of Call of Duty Black Ops 3, which showed that the player can run on walls. Sony also said that a beta would be coming to PS4 this August, and that DLC, including map packs, will come to PlayStation 4 first. Disney Infinity Star Wars: This game is scheduled to release this year on PS3, PS4, Xbox 360, Xbox One, and Wii U. Though PS4 and PS3 users will have access to the exclusive Boba Fett figure. 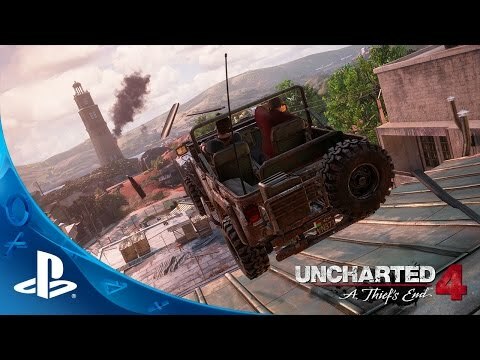 Uncharted 4: Sony released a new gameplay extended video for Uncharted 4: A Thief's End. The game is scheduled to release in early 2016 exclusively on the PlayStation 4. Project Morpheus: Sony didn't spend too long on it, but they spent a few minutes on their virtual reality (similar to Oculus Rift) headset. They also announced RIGS, a first person shooter would be compatible with it. PlayStation Vue: People can now buy individual, unbundled TV channels through PlayStation. At launch, Showtime, Fox Soccer, and a new channel powered by Machinima will be available for users to subscribe to.